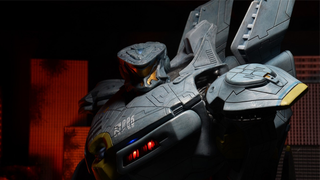 We’ve known for a while that Striker Eureka would be NECA’s next plus sized Pacific Rim toy — but now that the figure is hitting shelves next week, the company have released more pictures of the toy, and it’s looking rather lovely indeed. The 18” figure isn’t just packed with amazing details and a bunch of articulation, ready to be posed in a variety of Kaiju-tussling positions, but also has a ton of LEDs to light up her chest piece and head. And as you can see from these pictures, its other big bonus is the fact that it looks awesome. I’m usually a proponent of smaller toys — and I love NECA’s line of 7”inch Pacific Rim toys — but in this scale the Jaegers look absolutely wonderful. They’re nice and gigantic and appropriately “giant robot-y” goodness. There just needs to be some giant Kaiju for them to fight! The Deluxe Striker Eureka will be available from next week, for around $100. The battle to find space to fit Jaeger toys on my shelf continues!